I love this time of year when new blossoms seem to appear every day in the garden. I enjoy gathering flowers, leaves and stems from the garden to press each day. I don't mind changing the desiccant paper every 1-2 days during the pressing process to ensure fast moisture removal and bright colored results. The part I do NOT like is organizing and storing my bounty. Since we have received considerable rain over the last two days, I decided to bite the bullet. I took my stack of pressed flowers still encased in Viva paper towels and one by one removed roses, potentilla, pansy, delpinium, coral bells, coreopsis, larkspur, verbena, scabiosa, tiny daisies, lobelia, peony assorted leaves and stems and sorted them onto computer paper. My kitchen counters were covered with flowers. Then I placed each batch of flowers on cardstock cut to fit the size of the storage bag. Then I placed a piece of tracing paper over the top of the flowers and folded it over the bottom of the cardstock to prevent damage while inserting and removing the flowers from the package. Finally, I carefully inserted my bounty into freezer bags, labeled them and placed them in storage. I store most of my flowers alphabetically by name but they could be stored by color. The key is to develop a system which ensures you can find what you need when you need it. I found these lovely tiny, daisy-like flowers while walking at Seneca Lake Park. Of course, I had to pick some to press. Daisies are best to press when they haven't been open too long. One way to tell if the flowers are too old to press is by checking the center. If it is raised like the one shown below, don't bother pressing it. 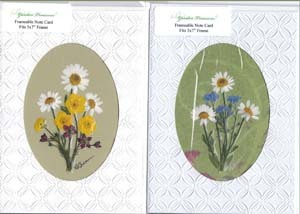 I decided to use my desiccant paper to press these daisies. Desiccant paper is made with silica gel and is very absorbent. I placed one sheet of desiccant paper on an old piece of paneling to protect it. Then I placed a sheet of Viva paper towel. I use Viva because it does not have a raised pattern which might transfer to the flowers. Then I added my flowers as shown below. 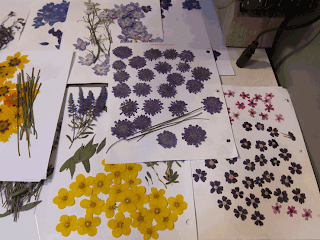 Most of the flowers were pressed with their stems attached but I also pressed a few flower heads without stems. 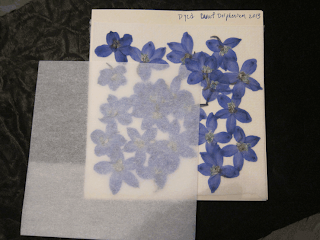 Once the flowers are placed on the Viva, I cover the flowers with another piece of Viva paper towel and then a second sheet of desiccant paper. If needed, I could add multiple layers of flowers sandwiched between the Viva and desiccant paper. When I am done, I place a second piece of paneling on top. Now I place the filled press in a warm area protected from rain and moisture and cover it with a patio brick as shown below. I checked my press the following day, and the tiny daisies were dried and ready to use. I removed them from the press and used some of the flowers to make the following cards. Now I'm ready to move on to the next pressing project. Aren't these blue Salvia lovely? I will use the same technique as above to press these flowers. Don't forget to press leaves along with the blossoms.